Stephen Miller hates people of color as much as he enjoys inflicting cruelty. That’s why he has President Trump’s ear on immigration policy. For all racist intents and purposes, Miller, a speechwriter and senior adviser who shapes and amplifies Trump’s worst instincts, is likely behind the Department of Homeland Security purge. Secretary Kirstjen Nielsen was the first to go, followed by other top DHS officials, including Secret Service director Randolph Alles. Nielsen, who made Cruella de Vil look like Mother Teresa, oversaw the draconian migrant family separation policy. Ripping children from their parents purposely evokes some of this nation’s darkest eras. Up to the line of the law, she was willing to do anything to exact extreme suffering on people who had already experienced too much of it in their Central American homelands. Nielsen’s actions included putting children in cages and internment camps, and tear-gassing migrants on the Mexican border. Officials recently said it could take two years to identify potentially thousands of children and parents separated at the border. It’s unlikely that many of these families, like those of enslaved black people in this nation centuries ago, will ever be reunited. Still, Trump and Miller considered Nielsen “weak.” The president wants even asylum seekers at official ports of entry separated from their children, criminalizing legal asylum. He wants the southern border closed, which would trigger an economic disaster on both sides of the border. For all of her immoral actions, Nielsen simply wasn’t barbaric enough for this administration. Kevin McAleenan, the Customs and Border Protection commissioner, will be acting DHS secretary. During a Senate Judiciary hearing last month, he refused to say whether Customs had a responsibility to keep migrant children in their custody safe. In Trumpworld, that would seem enough to qualify him for the job. But McAleenan is nothing more that a figurehead, a public face who will be expected to defend policies he had no hand in crafting. Miller is now running DHS, and everyone knows it. You can also bet Miller pushed for the recent disbanding of the department’s domestic terrorism unit, despite nearly 50 murders committed by right-wing extremists in 2018. Certainly he hasn’t gone about this the proper way, like being officially nominated or enduring pointed questioning from legislators. Instead, he will do what he has always done. Like a ghoul who will wither in the light, Miller will stick to the shadows — pulling levers and instigating ugly policies meant to keep this country as white as possible. 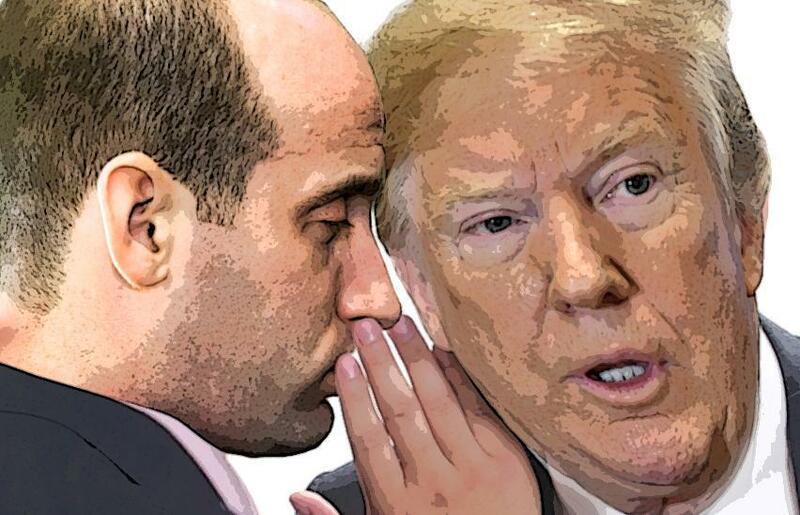 Miller is the Trump whisperer, and everything he tells the president feeds their white nationalist agenda. He did everything but hang a “No Vacancy” sign on the border. Miller may be making one as we speak. It’s by design that Miller, architect of the Muslim ban, has survived throughout Trump’s catastrophic presidency. While chiefs of staff, cabinet secretaries, and attorneys general have had less job security than a Spinal Tap drummer, Miller is still standing, and taller than ever. When Trump wants to go to extremes, Miller is there to push him even further. He’s the first man in, the last man out on immigration. With a racism streak as wide as the Rio Grande, Miller is living his white supremacist dreams at the expense of vulnerable populations and this nation’s laws and principles. In Miller, Trump has a partner whose racism matches his own. Now with many of his enemies vanquished, Miller is fully in charge. With this lawless president’s approval, he’ll circumvent any law by any means to slake Trump’s white nationalist base and keep people of color out. Stephen Miller is the architect of family separation at the border. He must go.